Validity studies of measures for emotional and behavioral disorders (EBD) for use with preschool children with autism spectrum disorders (ASD) are lacking. The Child Behavior Checklist 1.5–5 (CBCL; Achenbach and Rescorla, Manual for the ASEBA Preschool Forms & Profiles. VT: University of Vermont, Research Center for Children, Youth, and Families, Burlington, 2000), a widely used measure for EBD, contains several norm-referenced scales derived through factor analysis of data from the general pediatric population. 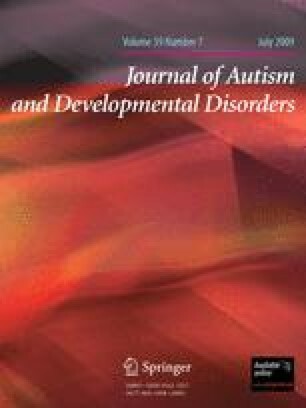 In this study, confirmatory factor analysis of archival data evaluated the adequacy of the CBCL factor model in a well characterized sample of preschoolers with ASD (N = 128). Psychometric results supported the model and suggested that practitioners can use the CBCL to assess for EBD in young children with ASD in conjunction with other clinical data. This will increase the likelihood of accurate identification and EBD-specific intervention. This study was supported in part by NIH grant U54MH066397 (STAART Center) and General Clinical Research Center grant 5 MO1RR0044, NIH, National Center for Research Resources. The authors thank Courtney McGuire for her assistance in developing the database for this study. The authors also thank Dr. Gerhard Mels for his technical support for some of the statistical analyses, and Dr. Thomas Achenbach for allowing us to reproduce data from the Manual for the ASEBA Preschool Forms & Profiles. Jöreskog, K., & Moustaki, I. (2006). Factor analysis of ordinal variables with full information maximum likelihood. http://www.ssicentral.com/lisrel/techdocs/orfiml.pdf.